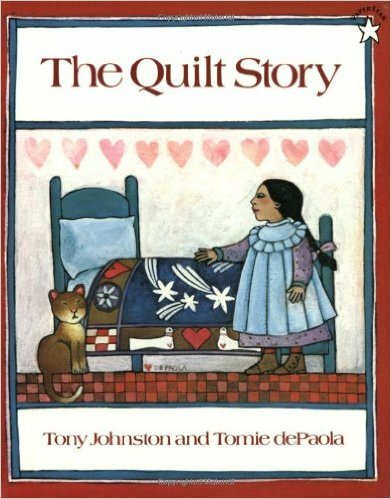 When my children were little, one of their favorite books was “The Quilt Story.” Written by Tony Johnson and illustrated by Tomie dePaola, this delightful story tells the tale of a quilt hand-sewn by a mother for her little girl, Abigail. By wrapping the quilt around her, Abigail is enveloped in the warmth and shelter of her mother’s love, easing the difficult transition of a move across the country in a covered wagon. Generations later, the quilt is resurrected from an attic and repaired-just in time to wrap another little girl when she moves to a new house. The quilt represents continuity, security, and the enduring love of a mother’s arms. Wrapped in the warmth of its folds, the child feels this love, and the strange house becomes home. 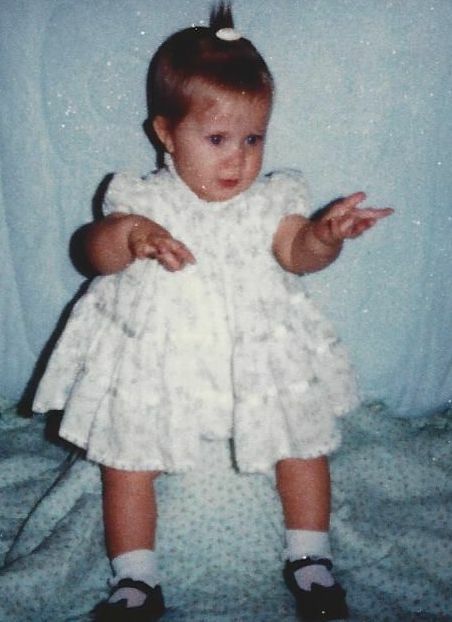 Abby at 1 year old. She’s sitting on the little green quilt. When my Abigail was born, the wife of my closest college friend made her a crib-sized quilt. She snipped and pinned and matched, and finally she stitched it together. It was beautiful- light green cotton dotted with tiny flowers on one side, patches of brightly colored hexagons on the other. I wrapped my little pink bundle in the quilt when I took her to church, and tucked it around her to shield her from the chill when I took her for walks in her stroller. Later, she used the quilt to wrap her dolls, and spread it on the floor for tea parties with her stuffed animals. Two years and two weeks later, I brought Gabriel home from the hospital. Gabriel was quite jaundiced, and his pediatrician suggested that I put him in a sunny window for small frequent intervals. I spread the quilt in the bottom of a pram, and laid my little son on top, so he might soak up the warm, healing rays. Later, the quilt became his superhero cape, and a tent for camping in the living room. Elizabeth joined the family on a frigid December morning, and the quilt shielded her from the wind when I hurried her from the car to our apartment. Unlike her siblings, Elizabeth never did outgrow the quilt, and dragged it with her wherever she went. As long as she could snuggle her quilt, she was safe and warm. She fell asleep in the car, napped at church services, and snoozed in a carriage while her brother and sister played, all wrapped in the little green quilt. As Elizabeth grew, she became sicker and sicker. She was hospitalized many times- sometimes for routine tests, sometimes for acute illnesses. Each time she went to the hospital, the quilt, now faded and slightly torn, went with her. We wrapped her pillow in the quilt, and she would immediately feel at ease, much like Abigail in “The Quilt Story.” Many nights I climbed into my sleeping child’s hospital bed, cuddling her bony little body close to mine, while silent tears slipped down my cheeks and sank into the folds of the little green quilt. Somehow, I too, would feel comforted. Perhaps it was the warmth beneath its layers, or the security that every child feels while cuddled under a hand stitched quilt, but Elizabeth grew strong and capable. To this day, she keeps the quilt nearby; its faded green tatters a reminder that the warmth of love shines a beacon to make even the loneliest places home. 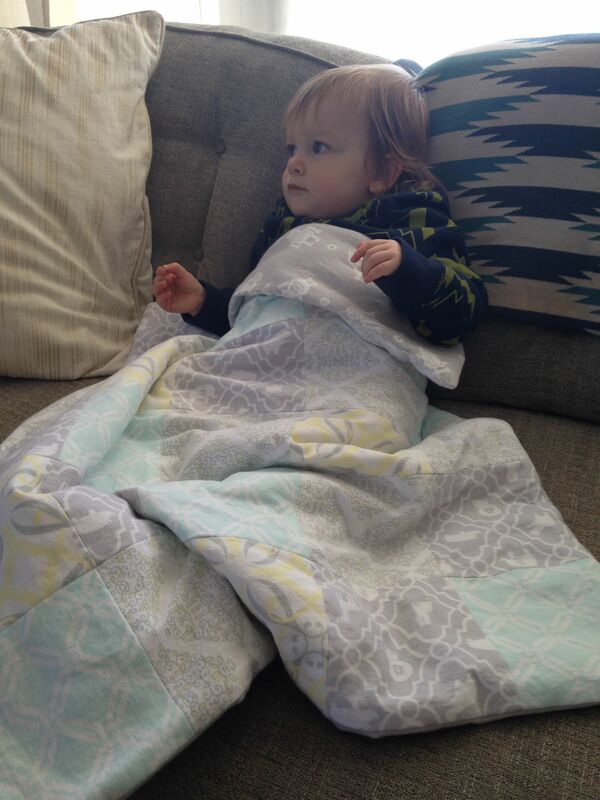 Judah at 1 year old wrapped in a quilt from his GiGi. And now we have Judah- Abigail’s son. My grandson. He calls me GiGi, and although he loves me, his favorite place in the world is wrapped in his mother’s arms. 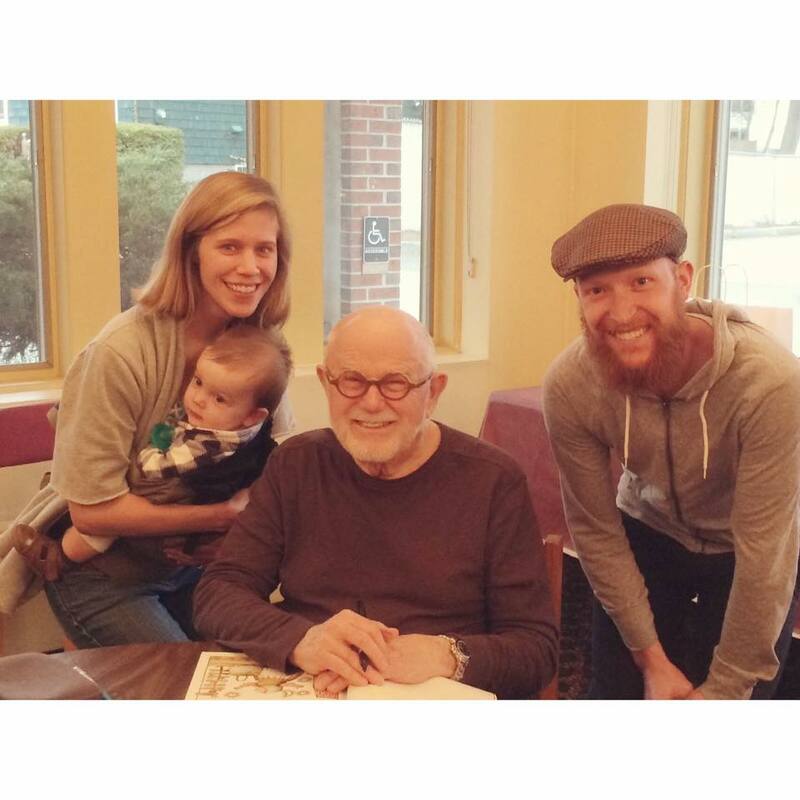 Judah met Tomie dePaola last spring, and although he is too young for “The Quilt Story,” I decided he needed a quilt of his own. So I snipped and pinned and matched and finally stitched it together. A quilt of the softest flannel, with robots on one side, and prints in gray, yellow, white and aqua on the other. It is a quilt to keep him warm when the New Hampshire winds form icicles above his bedroom window. It will become a superhero’s cape, be used as a magic carpet, and to hide under when things go bump in the night. The quilt will represent continuity, security, and the enduring love of his mother’s arms. Wrapped in the warmth of its folds, he will feel loved, and everywhere will be home.